Lori's Purple Giraffes: Freebie Friday! Isn't he SO cute? I love his adorable little face. :) I made this card with some new paper that I got at Archiver's and that white strip in the background was made using a new Martha Stewart punch I recently purchased. I hope you like Theodore as much as I do! Head over to the store to see the rest of the set. So so cute, thanks for playing along with SSD! He's too sweet! Love the punch you used on the white paper too! Such a sweet creation, just love the punch design behind! 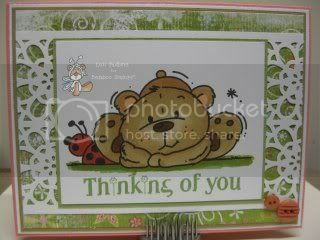 Really cute card love your image its adorable. Thanks for joining Delightful challenges this week, good luck! so cute Love the frame. Thank you so much for playing with us over at Sassy Studio Designs Dare to Be Sassy Thursday.